-The race will pass through the night time, so make sure you have a button bound to the headlights. -Tyre and fuel wear will return to 2X, and two mandatory pitstops. How come we don’t have a server up for this yet? I don’t want to turn up on the night and end up having issues trying to join. Argh, I have to travel to Tauranga tomorrow for work - I should be back on time for the start, though I may miss qualifying. I'll just have to make sure I won't show up on the starting grid wearing my Formula Renault 3.5 Surely no one will notice right? Has anyone PMd Riven the server settings etc? There are 3 versions of this modern track (0.80, 0.82 and 0.83), and both 0.80 and 0.83 do not work on server, and 0.82 does work, but has a track grip bug that makes the final chicane impossible to drive. Unfortunately I had done testing offline, and not on a server, so didn't pick up on the issue earlier. Edit: The race will take place using the VLM version of Le Mans instead. Sorry guys, I'm gonna have to cancel this event. There are 3 versions of this modern track (0.80, 0.82 and 0.83), and both 0.80 and 0.83 do not work on server, and 0.82 does work, but has a track grip bug that makes the final chicane impossible to drive. Unfortunately I had done testing offline, and not on a server, so didn't pick up on the issue earlier. My apologies to all those looking forward to this race. Just run the VLM version? Or even as a really desperate change, run Spa tonight until we find a version of Le Mans we like. Most of us know the place on a high level so the learning curve isn't so bad. 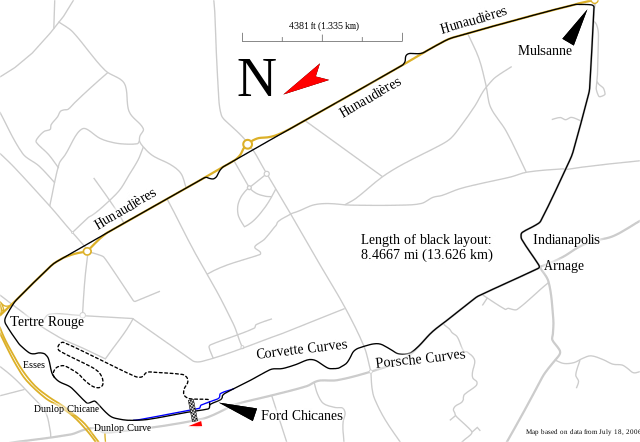 The race tonight will take place using the VLM Le Mans track. This is the 1991-1996 layout. I apologize to all who practiced with the modern layout. Big thanks to Riven for setting up the server with very short notice. Can someone indicate how this layout differs from the other one? I will not have any time to practice tonight before qualifying and the actual race? It's more or less the same, except after the Dunlop chicane (turn 1,2) there isn't the right hand kink. There are a few other differences by virtue of being made by different modders, kerbs and elevation and such. Cause you didn't notice everyone on discord while playing GTA? Rifty wasn't on Discord when the race started. Has anyone had time to update the points site with the results of the Le Mans GT race?